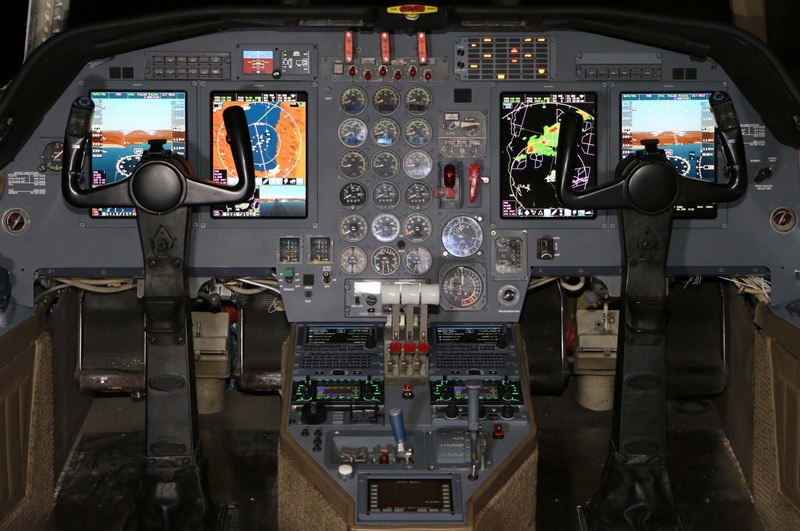 SolutionLAS VEGAS, NV – Universal Avionics Authorized Dealer, Chicago Jet Group, has been assigned a FAA Supplemental Type Certification (STC) Number for an InSight Display System flight deck upgrade on a Mystere-Falcon 50 aircraft. The STC covers the installation of the InSight Display System with 4 EFI-1040 Displays, complimented with other additional flight deck enhancements. The InSight system is designed as an integrated flight deck solution, featuring embedded: next generation synthetic vision with advanced mapping capability, electronic charts, frequency management, and broadcast weather. With fewer required external Line Replaceable Units (LRU) for essential functions than the existing avionics systems, InSight reduces weight and wiring in the aircraft. As an integrated system, InSight retains the ability to interface with a large number of federated components such as attitude/heading sensors, air data computers, radars, traffic systems, radios, and autopilots. Lower operating and maintenance costs, enhanced safety, situational awareness, and functionality for pilots are all possible with an InSight upgrade. In addition, a new Falcon 50 LED Master Warning Panel was designed exclusively for this upgrade with a flashing red master warning and amber master caution, new digital audio control panels, LED glare-shield lighting, and LED back lighting for the overhead panel, as well as ATC Safety Voice Approval. The new Master Warning Panel improves the traditional Falcon 50 instrument panel design by removing the incandescent annunciations and relocating them into the LED Master Warning Panel with an arrangement of annunciations that closely represents the same Master Warning Panel used in the Falcon 50EX. This upgrade will not affect existing TCAS 7.1 or ADS-B upgrades and will not require modification to the existing auto pilot system. For more information, visit Universal Avionics booth N2821 during NBAA-BACE 2017 while exhibit halls are open. In addition, Chicago Jet Group will be featuring a Falcon 50 InSight 4-Display System demonstration rig in their booth N3132 throughout the convention. About Universal Avionics Universal Avionics is a leading manufacturer of innovative avionics systems offered as retrofit and forward-fit solutions for the largest diversification of aircraft types in the industry. Markets served include Business, Helicopter, Airline (regional/commercial), Government/Military, Special Missions, and OEM. To learn more about Universal Avionics, visit www.uasc.com/company/about. About Chicago Jet Group Chicago Chicago Jet Group operates an FAA Class 4 Part 145 Repair Station with EASA approval, focusing on the installation and certification of NextGen avionics technology in Part 25 aircraft, in addition to providing airframe and engine maintenance. Contact Chicago Jet Group at www.chicagojetgroup.com; email: info@chicagojetgroup.com; Phone: 630-466-3600.